Isn’t it a little late for John McCain and the Republicans to start worrying about government redistribution of wealth? McCain claims to be alarmed by Barack Obama’s tax plan, which would tax upper-income people in order to provide tax cuts to lower- and middle-income people, many of whom don’t pay income taxes. McCain and running-mate Sarah Palin call this socialism. But the criticism is odd considering all the redistribution McCain has proposed in his presidential campaign and has supported during his long career. His proposed reform of medical insurance includes a tax credit so people can buy their own insurance. That may sound like standard Republican fare, except this tax credit is “refundable.” This is one of those Washington terms designed to conceal the truth. One ordinarily would think that only someone who actually pays income tax could get a credit against the tax. If your tax bill is $10,000, a $5,000 tax credit would reduce the bill to $5,000. But if someone pays no income tax, the tax credit would not apply, right? It would apply if the credit were “refundable.” With a $5,000 refundable tax credit, someone paying zero tax would get a check for $5,000. That money must come from someone else. It can’t really be a refund. If McCain thinks Obama’s tax cut for nontaxpayers is socialism, why isn’t his health plan socialism also? McCain might say that people who pay no income tax are hit with the payroll (FICA) tax, but Obama could say that too. But since that tax finances Social Security and Medicare benefits, both candidates’ plans still entail redistribution. McCain proposes to have the government buy up mortgages in which the amount owed exceeds the current value of the houses. Under the plan the banks would be paid the face value of the mortgages and the government would then refinance them at a lower principal and interest rate. The taxpayers, of course, would pay the difference. Isn’t that redistribution? He also supports the bailout of Wall Street financial institutions and the partial nationalization of banks. So where does he get off accusing Obama of socialism? This is nothing new. McCain and most Republicans have supported socialistic redistribution for a long time. I don’t recall their resisting President Bush’s humongous Medicare expansion that included prescription drugs. The program subsidizes lower-income people. So does the rest of Medicare and Social Security. And let’s not forget Medicaid. The progressive income tax itself is intended to transfer money from those who earn more to those who earn less or nothing at all. But the principle of tax progressivity is rarely challenged by the GOP leadership. They brag about dropping low-income people off the tax rolls. Occasional lip service is paid to the flat tax, but that does not escape the charge of redistriubtionism, either. Under flat-tax theory, a single rate would apply to everyone’s income. But in every flat-tax plan, there is a zero bracket exempting low-income people from the tax. Moreover, under a flat tax those who make more money would pay more than those who make less money. Ten percent of $1 million is more than 10 percent of $35,000. Assuming that government services are not allocated according to the amount of tax paid, we must conclude that a flat tax also redistributes income. Finally, McCain and Palin, as champions of a big aggressive military establishment, support the massive transfer of the taxpayers’ money to the military-industrial complex. Any forced transfer of wealth is an immoral violation of freedom. Both parties are guilty. So McCain and the Republicans should be careful about hurling the charge of socialism. 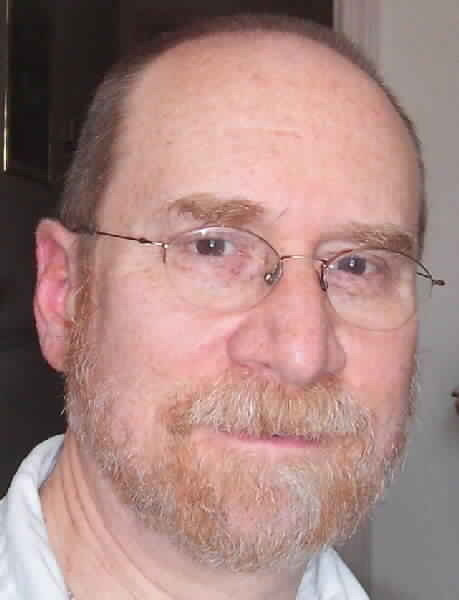 Sheldon Richman is senior fellow at The Future of Freedom Foundation, author of Tethered Citizens: Time to Repeal the Welfare State, and editor of The Freeman magazine. Visit his blog “Free Association” at www.sheldonrichman.com. Thanks for the post, but I would have stuck with my original headline, "An Echo, Not a Choice." Neither are Marxist socialists. Marxism and socialism seek to abolish the market entirely, not intervene in it for political objectives. 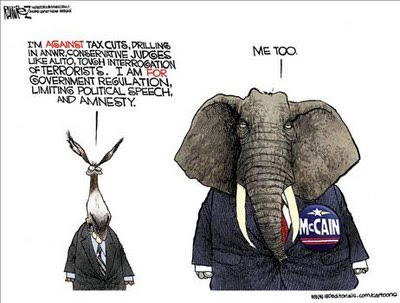 Neither McCain nor Obama wish to abolish the market. They simply want the power to distribute its fruits according to their own preferences. That's bad enough. No need to exaggerate their designs. I don't think I understand your definition of socialism. I thought communism was where the state owned all and distributed production. Where as socialism was were the state did not own capital but just taxed and regulated it so that it still controls distribution of wealth. That sounds like McCain and Obama to me.